Christmas Day with this wonderful activity sheet. Each sheet helps students make their own booklet that will guide them through the Christmas season including- the solemnity of the Nativity of the Lord, the feast of the Holy Family, the solemnity of Mary the Mother of God, the solemnity of the Epiphany of the Lord, and the feast of the Baptism of the Lord. 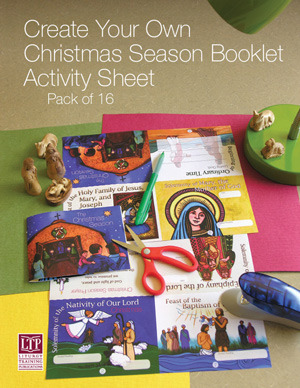 Sold in packs of sixteen activity sheets, each Create Your own Season Booklet Activity Sheet also includes reproducible instructions that provides teachers and catechists with important background information and suggestions on how to use the sheet as a learning tool. All of the activity sheets are outstanding for use with or without other resources in the CTL series.